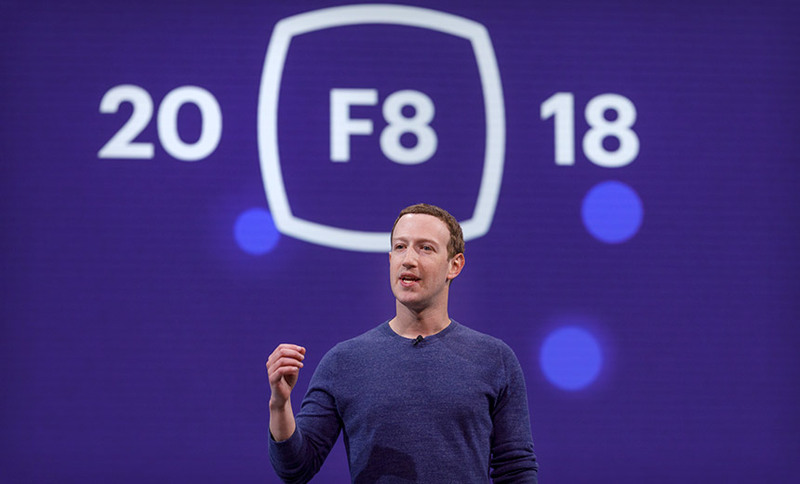 Facebook CEO Mark Zuckerberg speaks on May 1, 2018, at the Facebook F8 Developer Conference in San Jose, California. Facebook is making substantial investments to improve its data security and privacy practices. But the long-term cost of those investments and impact on the bottom line has spooked investors, leading to a $120 billion loss in market value on Thursday, the largest one-day loss of value for a U.S. traded company. CEO Mark Zuckerberg said in a Wednesday earnings call that his company had “a solid quarter,” with revenue growing 42 percent year over year to $13.2 billion, and the social network now counting 2.2 billion active users monthly, with 1.5 billion people using it daily. But Zuckerberg warned that the company’s security and privacy initiatives are already impacting the bottom line and will continue to do so. The company has been driven to overhaul its security and privacy practices as it faces probes in multiple countries into its mishandling of tens of millions of users’ private details, which ended up in the hands of third parties such as Cambridge Analytica. Facebook’s platforms have also been abused by nation-state actors and others as part of information warfare efforts as well as hate speech campaigns that have triggered violence in places such as Myanmar – aka Burma – as well as Sri Lanka (see Facebook Battles Election Interference, Internal Criticism). Dave Wehner, Facebook’s CFO, then delivered the particulars on the earnings call. The drop in advertising revenue was most pronounced in Europe. Wehner blamed “reduced currency tailwinds and, to a lesser extent, the rollout of GDPR” – the EU’s General Data Protection Regulation, which came into effect on May 25. While Facebook’s operating margins are currently 44 percent, and the company’s profit grew in the second quarter, Wehner predicted margins would fall to the “mid-30s” over the next few years. The news did not please investors. By the end of trading Thursday, the stock price was down 19 percent for the day. Wehner said that GDPR appeared to be having only a “modest impact” on the company’s revenue growth, even though it was only in effect for about one month of the second quarter. In part, he said that’s because people have been opting out of some data sharing. Investors may have been partly spooked by Facebook reporting that its advertising growth slowed most in Europe, apparently due in part to GDPR, even though analysts hadn’t expected the new data privacy law to have any such impact. “They’re talking about currency headwinds, but more we think it’s due to slower user growth given GDPR and more focus on privacy,” said Morningstar analyst Ali Mogharabi, Reuters reported. Some analysts reacted by noting that Facebook, as with other firms that rely on advertising revenue, cannot grow forever. “The core Facebook platform is declining,” said Brian Wieser, an analyst at Pivotal Research Group, in an analysis published after the earnings call, Bloomberg reports. On the earnings call, Facebook said that it’s taking repeat attempts to weaponize its platform for information warfare campaigns and to interfere in countries’ electoral systems seriously. In part, the company says it’s doing that via artificial intelligence – in this case, however, perhaps more accurately known as machine learning (see What’s Artificial Intelligence? Here’s a Solid Definition). Regardless, Facebook’s senior management team appears to be making a serious effort to overhaul the social network’s approach to security and privacy. The new approach appears to align with a no-holds-barred analysis distributed internally at Facebook on March 23 by departing CSO Alex Stamos, who called on the company to get its privacy and security act together. He also said the company needed to listen when it was accused of doing something “creepy” by users or employees. “We need to build a user experience that conveys honesty and respect, not one optimized to get people to click yes to giving us more access,” Stamos wrote in his memo, which was first published on Tuesday by BuzzFeed. GDPR may yet have a more direct impact on Facebook, since companies can be reported to independent authorities for alleged violations of the data protection law. At midnight on May 25, Austrian privacy rights campaigner Max Schrems filed complaints worth €3.9 billion ($4.6 billion) against Facebook and its WhatsApp and Instagram subsidiaries, accusing them of forcing users to accept “coercive” new terms that undercut GDPR’s protections (see Europe’s Strong GDPR Privacy Rules Go Into Full Effect). Schrems heads a new privacy lobbying group call noyb – for “none of your business.” He’s previously filed claims against Facebook, Google and other technology giants alleging that they violated European privacy laws.